My beloved New England Patriots are preparing for the Super Bowl and a rematch with the hated New York Giants. The big game is less than a week away. So I figured what better time to go to the back issue box and look at a Supergirl football story (albeit college football). 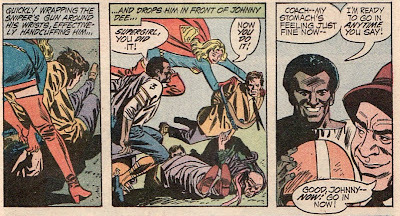 Adventure Comics #399 had Supergirl getting involved in the seedy underbelly of gambling and sports in the story 'Johnny Dee -- Hero-Bum'. This was a full length story written and drawn by Mike Sekowsky in the pre-'limited powers' portion of the Adventure Run. I really appreciate what Sekowsky was trying to do in this Adventure run, maturing Supergirl and making her a more serious hero. If only he hadn't done the 'de-powering' pill storyline. 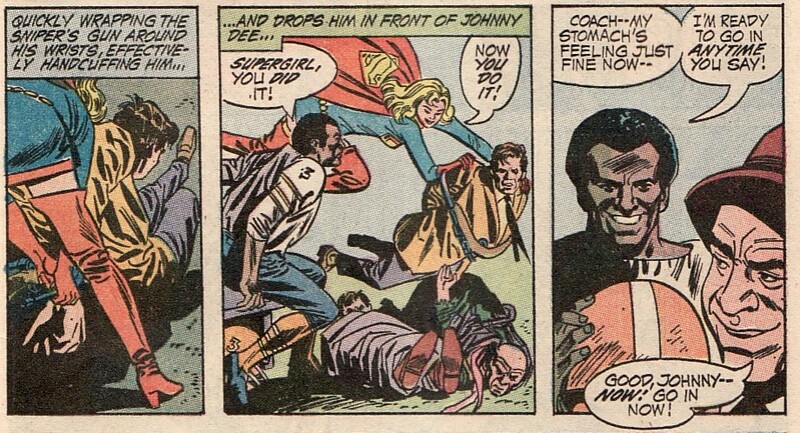 The issue starts with Supergirl directly questioning Johnny Dee, the star player for Stanhope's football team. It turns out that in the last game, Johnny claimed he was sick and couldn't play. The result is a loss to Leesville. 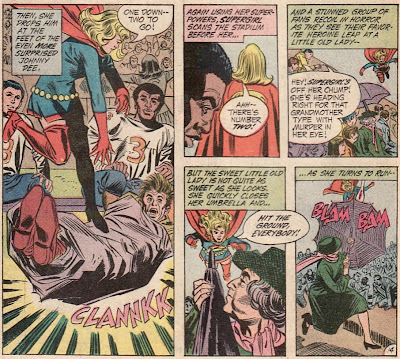 And Supergirl being the big fan she is thinks she smells a rat and confronts him. It is an odd way to start the issue. We are dropped into the end of a conversation and don't really hear what it is about. I am showing the scene in its entirety. 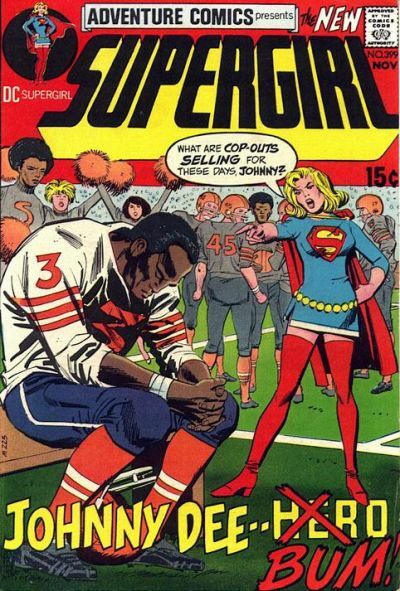 We only learn about it Also, it seems off that someone of Supergirl's stature would take the time to pester a college quarterback, even if she could tell he was not ill and able to play. We then get a brief origin montage of Johnny, how he was a walk-on phenom for the team. And he seems like a Tim Tebow/Cam Newton style quarterback, both running and throwing for insane yards. We also learn how he had fell in love with another student Roxie Thompson. Doing a little supervision spying, Supergirl sees Roxie crying and visits her. This prompts a face to face to face discussion between Supergirl, Johnny, and Roxie. Johnny then reveals that he has been threatened and beaten by gamblers. A bunch of hooded thugs batter him and Roxie with clubs and whips. It is a chilling scene. He has to throw the game against Rawlings or both of them will be hurt. The coloring of this scene is effective, mostly blue hues except for the most violent scenes which are tinged with red. And he does throw the game, fumbling the game away. That means he has thrown the game against Rawlings and sat out against Leesville. When pressed about why he didn't go to the police, Johnny says he couldn't risk it. Plus he can't give them any details. 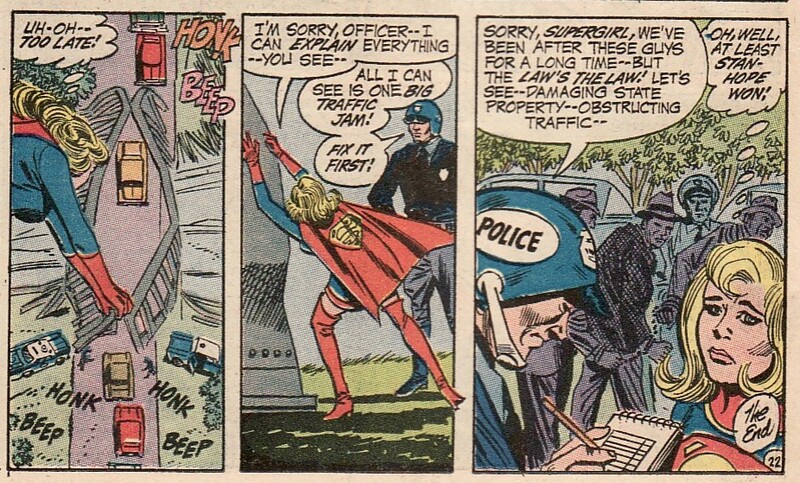 Supergirl seems to have little confidence in our police force as she agrees with him that they couldn't be of any help. Really?? Couldn't they tail Johnny and intervene? Put a wire on him? Do anything? But Johnny wants no help. 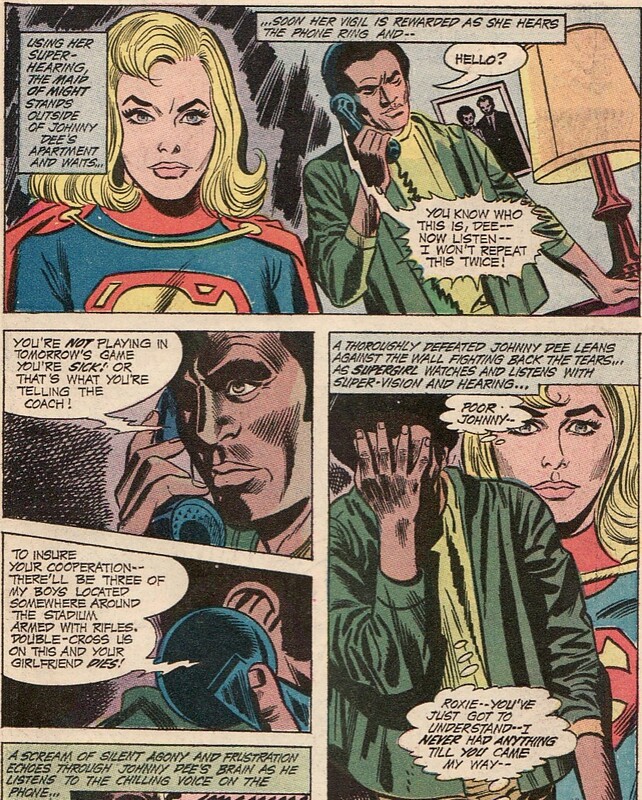 He can't risk Roxie suffering and so he throws Supergirl out, asking her not to intercede. Kara has a bit more tenacity than that and decides to stick around and eavesdrop. Sure enough, the gamblers call up. Johnny is to sit out the next game. And to make sure he follows commands, they crooks will have three snipers placed around the stadium, their sights locked on Roxie. 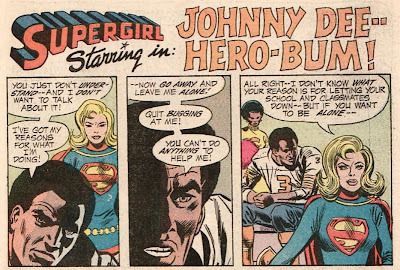 Nice last panel there with Supergirl in the background large as listens in on Johnny. Good layout. But Supergirl isn't going to let this happen; she isn't going to let Johnny sit out or let Stanhope lose. So she scours the grounds, rounding up the gunmen. First she wraps one up that she found on the roof. Then she captures one who is dressed like an elderly woman and armed with an umbrella gun. And then she gets the last one who is stationed on the top of the announcers' booth. 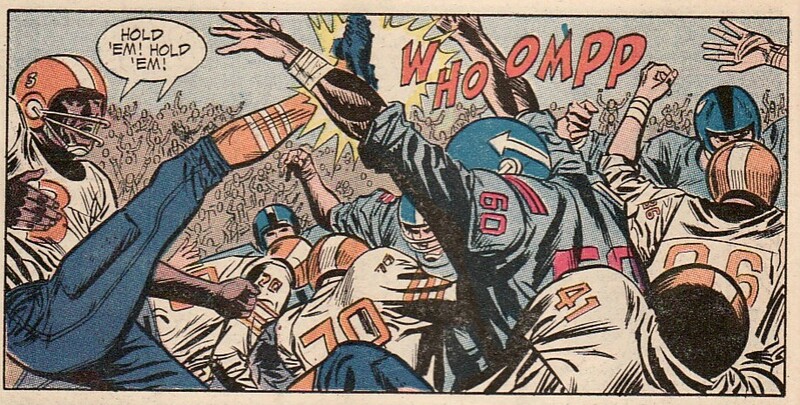 With the snipers rounded up, Johnny suddenly feels better and asks to go into the game and drives the team down the field, rushing for a touchdown himself. Unfortunately, the syndicate isn't happy and decide to show Johnny they mean business by kidnapping Roxie from the game. Supergirl is able to track them down. In an interesting move, Supergirl captures them on a small bridge, bending the ends of the bridge shut, creating a cage. She grabs Roxie, thrashes the crooks, and then melts the car doors, sealing them in. 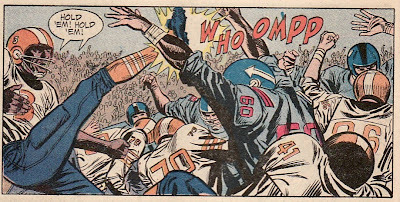 With little time left in the game, Supergirl flies Roxie back to the stadium at top speed. As time expires, Johnny leads the team to victory, kicking the game winning field goal! What a match-up nightmare Dee must be to opposing coaches. He can throw. He can run. And now he can kick? How would you set up your defense if every time Stanhope lines up for a field goal, the ball could be going into the hands of this All-American who could run or pass! I love the ending, the perfect sort of Supergirl story finale. Despite stopping snipers, rescuing a young woman, and protecting the integrity of a hard working college athlete, she gets written up for bending the bridge leading to a terrible traffic jam. She tries so hard, is successful, but sometimes doesn't get a fair shake. Sekowsky's art is solid. And I actually don't mind this version of the costume, the miniskirt and thigh high boots fit the time of the story. 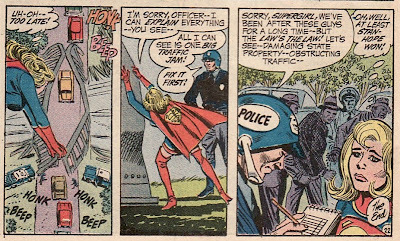 And there are some fun parts of the issue for example, the man dressed as a granny, at one point Supergirl vibrates through a wall like the Flash. As for a Supergirl collection, this is just another issue and of no major importance for the character. The football angle is the only unique thing. It is probably available for $5-$10 for the completists out there. Now, if only Supergirl were around to lend a helping hand for my Patriots, who I fear have their hands full with the Giants! Over on CBR, Dan Jurgens and Keith Giffen were interviewed, discussing their approach to the Superman book. The whole interview can be read here and is well worth reading. 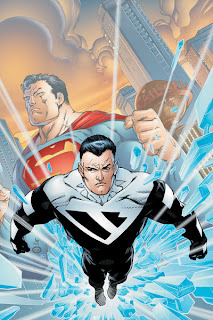 It is interesting to see what pieces of Perez' work they are picking up and what their thoughts about Clark, Lois and Clark, and Wildstorm characters making their way into the DC mainstream. As usual, some of the questions grabbed me more than others. Here are those questions with my comments. Before we get there, I have to comment on the Jurgens art that has been previewed for the run. It looks fantastic, more detailed than his stuff from the 90s. That picture above is just great. CBR: DC editor Matt Idelson recently announced there is going to be a big "Superman"/"Superboy"/"Supergirl" event this summer. As the flagship title, are you guys sort of leading the charge and setting the pace for the event? 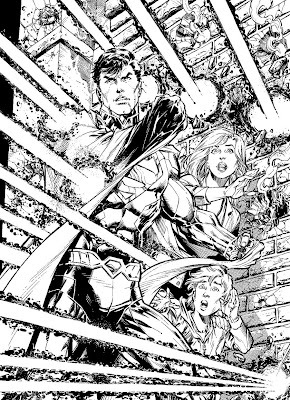 Jurgens:The idea is, and again, this gets back to where we were originally in the conversation, that yes, this is a new DC Universe and we have a somewhat re-imagined Superman, Superboy and Supergirl. So, what are their connections, if any? Or is it going to be a situation where the connection is so distant there really isn't one? How do they interact with each other? What we're looking to build here, along with the appropriate creative teams from those two books of course, is we want to set up what exactly are those relationships, why these three characters see each other the way they do. I think there's something there that's very compelling and interesting because it simply isn't going to be what it was a few years ago. Giffen: With any bit of luck! I have to point out right up top here that I am not the hugest fan of the boy/girl, lad/lass, dog/chimp rule of superheroes wherein you take a character and then just introduce dozens and dozens of different variants. So one of the things I would hope with this crossover, what we can do is, instead of making these characters seem more similar to each other because they all wear the S, is make them as dissimilar to each other as humanly possible so each character is still a unique character in of itself and not just part of a bigger family of like characters. That's always driven me crazy. So, I have to wonder what all of this means. Okay, so they want the relationship between the 'Supers' to be different than it has been the last couple of years. Way back then, they all seemed to get along. Superman was a role model. And they all wanted to do good. So I don't think that is too bad. Now, I don't mind if they are 'dissimilar' to each other personality wise as long as the fundamental heroism of the characters are still there. Back in Jurgens first run, the characters were different. Superman was Superman, beloved trusted leader. Superboy was a brash young kid who was girl crazy. Supergirl was a naive hero just starting out. But they all worked together to be heroes. So you can have different personalities, still respect one another, and still have the same goals. What I don't want is this story ends and they all walk in different directions not liking each other. CBR: Have you already begun fleshing out the crossover with Scott Lobdell on "Superboy" and Michael Green and Mike Johnson over on "Supergirl?" Jurgens: We have, which again, we're very much in the opening stanza of that dialogue, but we've all gotten on the phone a few times and talked about it. Part of it is just coming to an understanding of when does this particular story for "Superboy" close, when does this story for "Supergirl" and "Superman" close, so we can synch up the timing on everything. If it's a stand-alone, three-issue miniseries, it's easy to do. But when you have to bring all your existing stories to a natural conclusion, it's a little more complex. But we're getting there. Giffen: We're still at the "Gee, wouldn't it be neat if?" stage. Somewhere down the line a more solid direction will come out of these phone calls where everyone is just throwing their wish list out there and seeing how everyone else responds. At least it sounds like nothing is written in stone. Superboy is still such an unknown commodity. Does Superman even know he exists? And Supergirl and Superman need to mend the family fences. I am glad they are bringing them together ... together again for the first time!!! ... but if this is going to be the foundation of the super-family moving forward, I hope it isn't a foundation of distrust and dislike. CBR: Idleson also mentioned that you have big "star-spanning" plans in the works for Superman. After Helspont, are you going to be focusing on more external cosmic and alien threats rather than threats coming out of Metropolis itself? Jurgens: No! I think if you're in a room with editors and writers, one of the words that get thrown out there is "cosmic." Really what we're talking about is power. I think with Superman, the two best Superman stories really fit at both ends of the yardstick, which is very small personal stories that can only happen to a Superman or Clark Kent, but then you cross out everything that is in between and get to the other end of the yardstick where you do big and powerful and "cosmic" stories. When we say it, we don't necessarily mean threats from another planet. What we're looking at is power and scope. I think that's really what we're trying to introduce to the book. 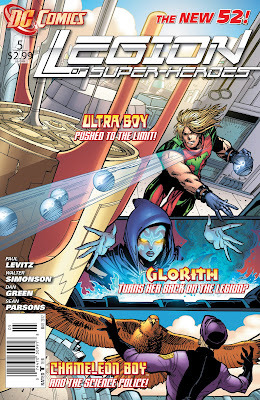 Giffen: Legion Of Super-Heroes fandom used to have a phrase: a "sense of wonder." I think that is what we're trying to bring back to Superman, at least that's my primary goal. Bring back that sense of wonder about the book, the feeling that you'll pick up the book and see something in there that you've never seen done or never seen done quite like that before. Somewhere along the line, that sense of wonder in comics got lost and I think it's time we bring it back. I think I am not alone in craving good Superman stories given the last couple of years. We have seen them in Action so far. 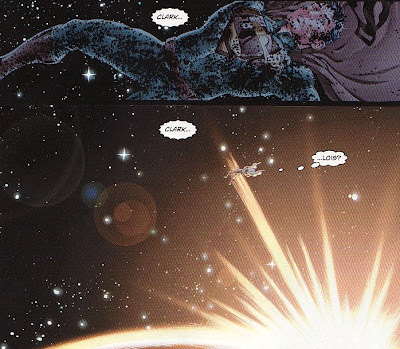 So space-faring, cosmic Superman stories would be pretty cool to read. That said, the state of Superman in the current DCU, what he means to Metropolis, to the world, in the now (Action being in the past) is still vague. And I would rather have that solidified before we Superman in deep space battling galactic threats. 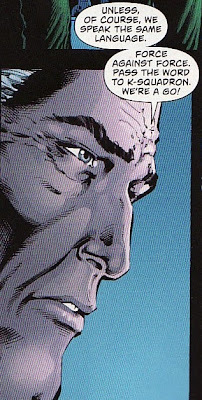 Jurgens and Giffen both say in the interview that the mistrust of Superman will continue as an undercurrent ... but one of many reactions to Superman. The thing is, I still would rather have Superman be the role model, the ultimate hero, the trusted protector of the city. Someone has to be the standard. And there are many many titles out there with heroes the public is unsure of. Heck, every Xmen title has that theme. I don't think I need to read it here. I consider myself a big Giffen fan. And I like what Jurgens did on Superman in the past. So I am hopeful. 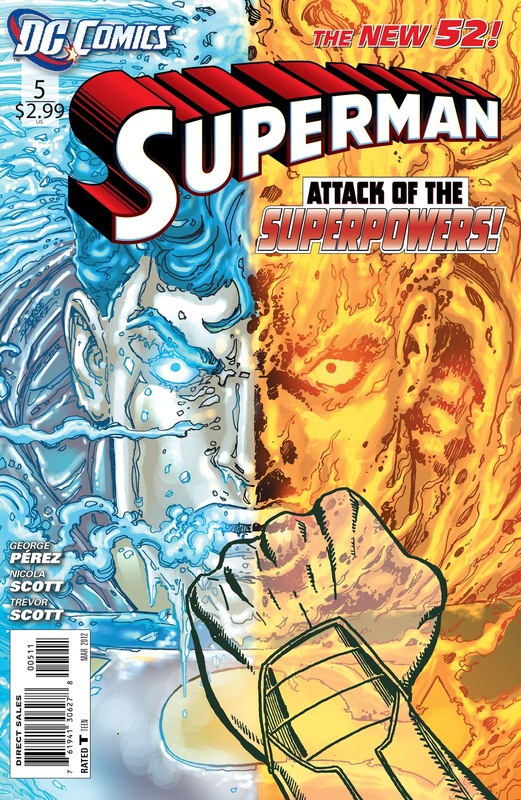 Superman #5 came out this week, the penultimate chapter in George Perez' brief run on the title. I always worry about the second to last chapter of arcs. The story has to be brought to a point where an appropriate and satisfying conclusion has to happen in the next issue, in a short 20 pages. I usually hope that any major reveals have been revealed (even if it is a last page splash) so that the finale is all about conclusion. If there is a big reveal and the finale in the last issue, I usually think that things are rushed, that neither the reveal or the conclusion is given enough time to breathe. And my guess is that there isn't going to be enough space next issue to satisfactorily wrap things up. We still don't have all the answers, we still have to have a 'final battle', and we know that Supergirl is going to guest star adding another element that needs to be covered. Heck, this is the second meeting of the two cousins ... that alone should be given several pages to cover their emotions. Anyways, I do want to commend Perez for continuing his pattern of dense story telling here. There is a lot of stuff happening in this issue, in all of his issues. And while not everything needs to be answered in this arc, the major plot points need to come to fruition. I guess we'll see. 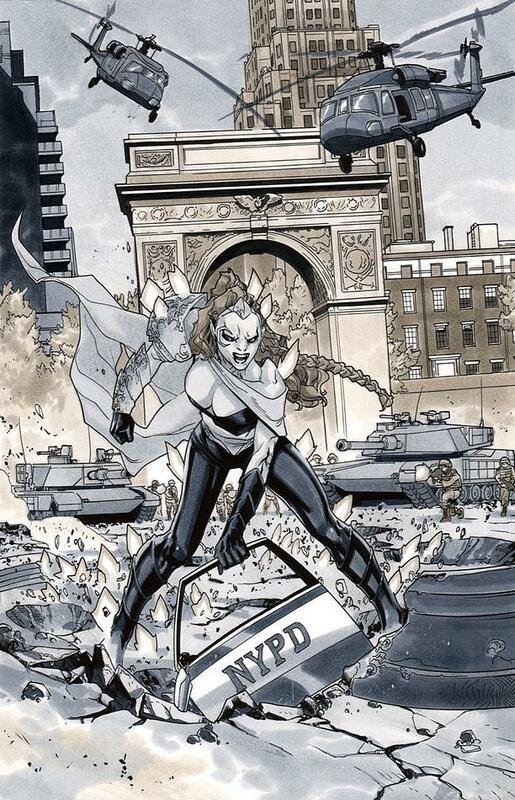 Art is again done by Nicola Scott and she does a great job channeling Perez here with inset panels and big action. Her art is solid. I can't wait to see her on Earth 2. Last issue we learned the alien avatars of fire,ice, and invisibility were created by Superman at some point (although he doesn't seem to remember making them). And in the opening pages of this issue, they seem to be attacking him. A cyclone of fire and ice is focused on Clark's old apartment building with Superman floating at the top. From a characterization point of view, it is a good scene to see the PGN staff mobilize for the story. Jimmy and Miko remain on the ground, rushing into the dangerous scene for up close reporting. Ron Troupe is also there, but farther back taking in the big picture. And Superman gadfly Billi McCoy is in the news chopper to get the bird's eye view. Perhaps best of all is Lois managing things from the Planet building, both eager to get the story but worried about her staff. Superman somehow absorbs the cyclone into himself. Then speaks the language the aliens have been speaking and claims himself as the savior of the city. It appears that he somehow absorbed the alien presence from their human hosts. He drops them off for medical care and then takes off. One thing I like about this scene (although I haven't shown it) is that when Superman makes the cyclone disappear the people on the street are cheering him. This is in contrast to McCoy who continues to wonder if Superman is part or the source of the problem. Not everybody distrusts Superman. But then Superman goes on a mini-rampage, scouring the city of potential threats. With little regard for possible human casualties, he vaporizes the Fleisher giant robots, freezes the Sky Raiders gang members to death, and immolates Titano and 'other mutations'. Superman kills. For a while I have wondered if these entities represent a New DCU Eradicator. There is too much use of words like 'purge' and erasing 'contagions' for me to change my opinion. The city appropriately responds negatively. Some, like the mayor, plead with him to fall back into line. Other like McCoy go on the attack wondering who can stand up to him. But acting as judge, jury, and executioner ... sounds like the Eradicator. And, of course, who is the person who wants to step up to the fight? Why General Lane and a new K-Squadron. So again, the military wants to attack Superman, an all to common theme these last several years in comics and a mere month since they actually did attack him in Action Comics #4. But seriously, when has any K-Squad been able to do much against the man of steel. Unfortunately, it seems as though this prickly Superman doesn't like dissenting opinions either. McCoy is flooding the airwaves with anti-Superman sentiment. 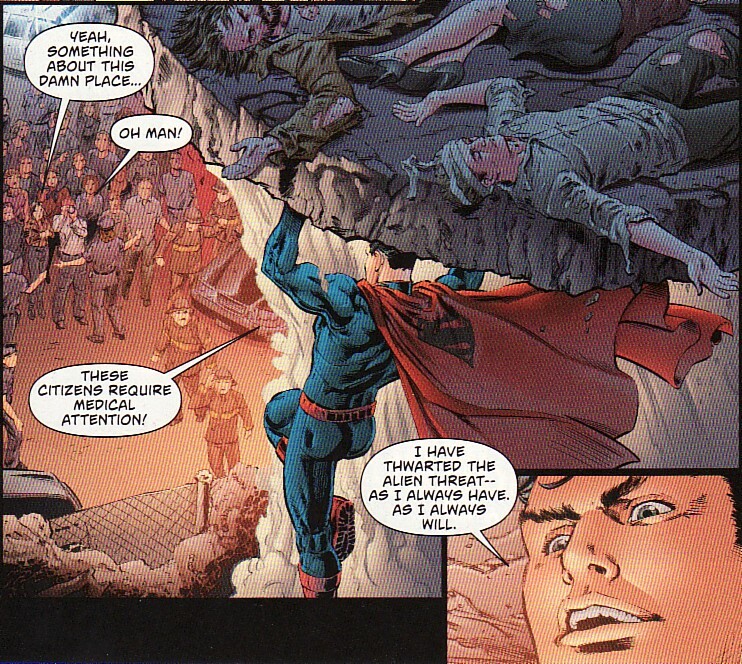 And Superman doesn't like it feeling it interferes with his mission to keep everyone safe. And so, he bursts into the Planet and drops McCoy from the top floor. But then she says she wants him to pick up the phone. So maybe I'm wrong. I still think she knows there is a connection between Clark and Superman. 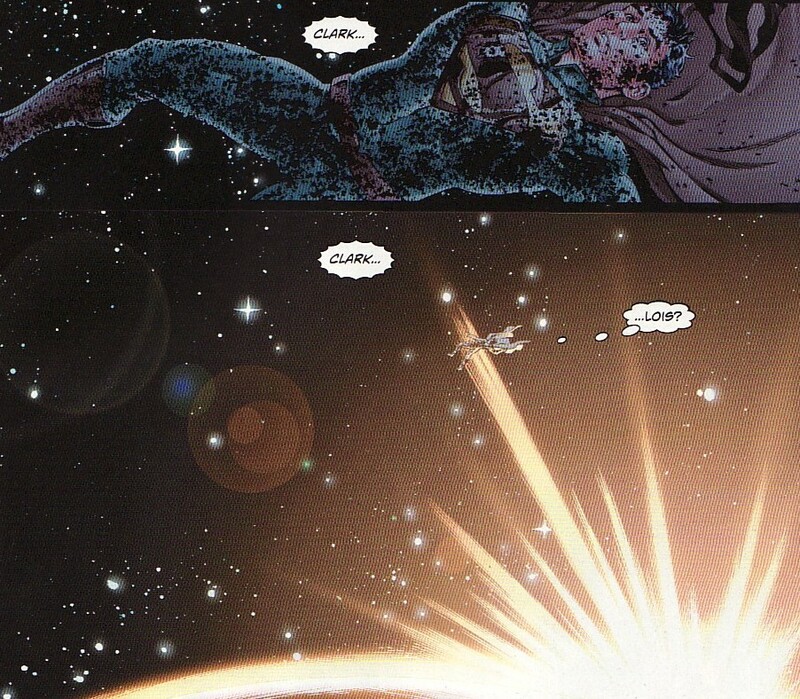 And while he doesn't answer his phone, her call does awaken THE REAL SUPERMAN who is charred and floating in space. So this killing Superman is some simulacrum comprised of the alien presences. But it also means that they walloped Superman enough that he has been unconscious long enough for them to run amok. How long does it seem this Superman was active ... days? Incredible. But more impressive is that Lois' voice awakens him! I keep hoping that a Clark/Lois relationship will happen. Of course, the fans in 1938 had to wait 50 years! So maybe I won't see it! Anyways, while this issue showed what an out of control Superman might do, we have seen this before. Maybe too many times. And I wouldn't mind this issue that much if there were 2 more issues to wrap this up. But in 20 pages we need an explanation of what these alien things are, a Superman/Supergirl fight, a Superman/FakeSuperman fight, some public response to this guy not being the real Superman, and some denouement of all the 'where was Clark, what is wrong with him' angst we have been wallowing in. I don't know if that is enough time or space. Now the Clark stuff might linger ... but the rest of it needs to happen. And if the origin if these things is explained in 3 panels, I'm not going to be happy. I suppose I shouldn't judge this issue on my perceived problems with the next. But I can't help it. As always, I highly recommend going to the site and reading the interview in its entirety. It really gives a lot of details about the story so far, with lots of hints about what is coming up. As usual, I picked a couple of segments of the interview that struck me and added some of my comments. Newsarama: In issue #5, Supergirl finds out that it's all true. Krypton's really gone. How important was this moment for the title? It's a real turning point, isn't it? Michael Green: For us, her finding out what happened back home, and that "home" is gone, is probably the most foundational part of her back-story. If Superman's never-ending story is, "what is my place in this world," because he got to grow up here and be an out-of-place child here, her story is so disruptive that her story becomes, "what happened to my world? Where did those people I love go?" We wanted to make sure we gave as much attention to those emotions as possible, and really make that the first big piece of her story, finding out that it's all gone and dealing with it. It's real loss. It's everyone know you know and love is no more. There's nothing to do about except honor their memory by staying a good person in the face of it. So the interview starts off with a bang with this response from Green. The biggest thing I like about this answer is that he says that the best way for Supergirl to honor Krypton is to be a good person. There isn’t the ‘sulk and isolate yourself’ feeling from this response, the biggest concern I had about the characterization of this new Supergirl. 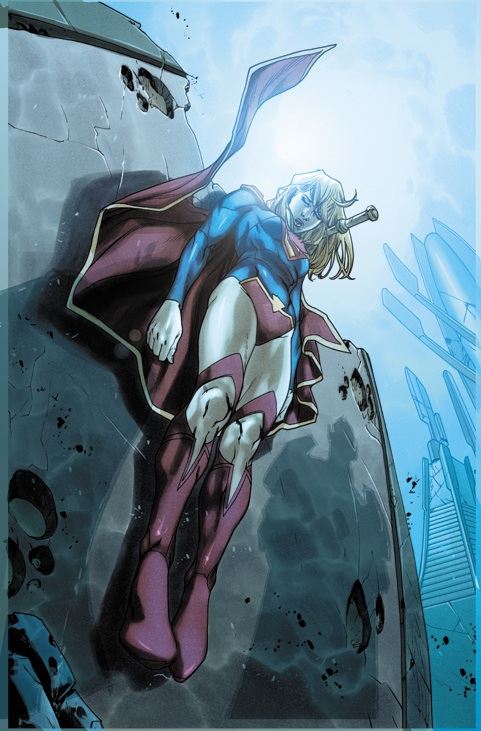 Nrama: Supergirl has been constantly in danger in this comic, and when she found out that her world had been destroyed is coupled with danger yet again. Green: We wanted to keep her from being allowed by life to have too much time to process and grieve. She's getting bad news while still very much a participant in her adventure. So it wasn't something that she heard and then got to sit with for a long time. I think if Clark had his way, he was going to give her the bad news and then sit with her as she cried it out. But she resisted that, because she just wasn't ready to hear it. And as a result, it's just been a roller coaster for her. Johnson: And part of that is the larger story that we're building to, which is how she got here, because as you saw in issue #5, somebody got their hands on the shard that recorded the father's death, and why would that be in her pod with her? Who put it there? And who ultimately sent it there, even though the pod was her father's plan to have her survive the death of Krypton? Glad their take on Clark’s response mirrors my own. I do think he will want to help her and hopefully she will allow him to help her work through these issues. And I am glad that I was asking the right questions in my review of Supergirl #5. Who did rocket her? Who did put the crustal in there? We assume Zor-El got killed. So is it time for an Alura sighting? 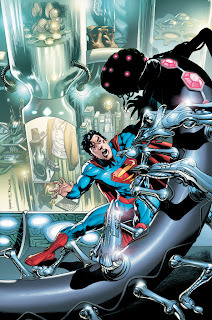 The picture above looks like Kara sparring with some robots. This must be part of ‘Zor-El’s plan’ or part of what she was preparing for. It also explains why she thought Tycho’s robots were from Zor-El. He has to have been a military scientist. Notice how she is wearing different style boots? I wonder if she could fold the 'over the knee' portion down to make more like a buccaneer style version. Nrama: Mahmud Asrar drew a very emotional moment, when she saw her father die. And you really relied on him for this, didn't you? Johnson: It sounds horrible to say, but my favorite panel so far that we've seen is the panel where she just sort of screams and lets it all out. But you're right that we relied on him in that moment. We told Mahmud, "We're not going to put any captions or dialogue here, so it's all on you." And he just nailed it, better than we could have imagined. And any words would ruin that image. But it's the most emotional moment that we've had so far. Green: And that moment, the scream that you see as she realizes she has lost her family, was the moment we'd been building toward, that moment of her really feeling it, her realizing it's true, and just being in pain. I’ll concur that this panel was powerful and didn’t need anything else. Asrar just shines on this book. 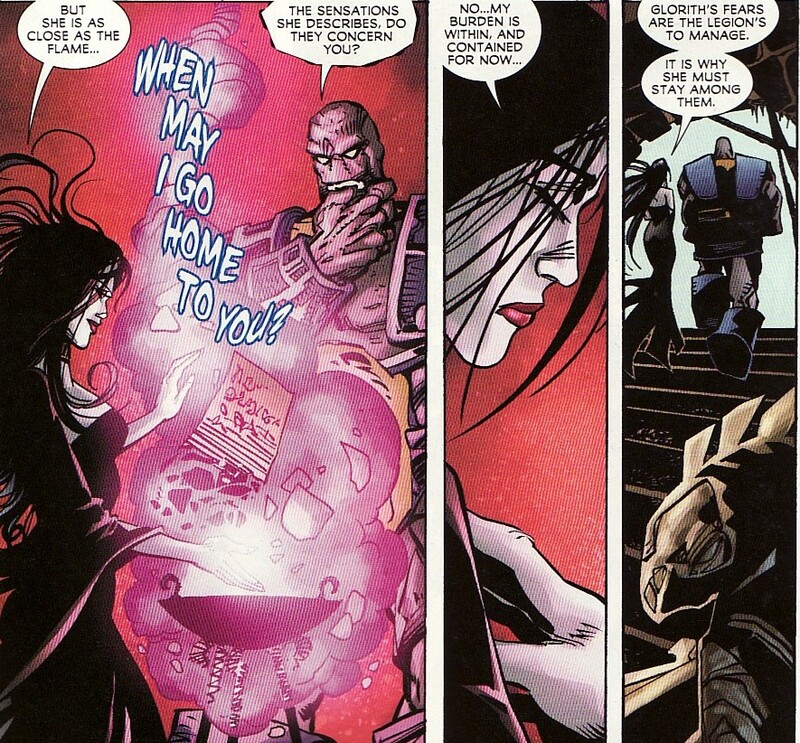 Nrama: We found out who the Worldkillers are, thanks to the appearance of this new villainous character, Reign. And Supergirl isn't really not on the same side as Reign, and yet she they're both looking for the same answers. What does Reign represent for Kara? 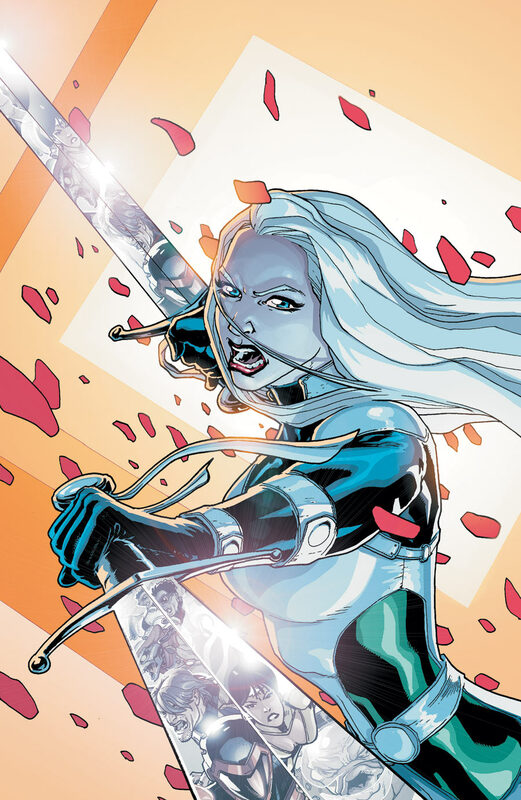 Johnson: Reign will be an ongoing, important member of Kara's rogues’ gallery. And the best villains, I think, have something that connects them intrinsically to the hero. Reign is a twisted reflection of Kara. She has all this power, but she's a little bit of a loose cannon. Green: We wanted Kara to be able to see some of herself in there. And in a way, it's temptation, because she's so much in pain that there is a part of her that does want to be like Reign and get angry, and use that pain to get even or just feel better by taking what she wants. And that is a real temptation, especially given the insane amounts of power she woke up with when she landed under the light of a yellow sun. I called Reign a dark reflection of Kara and I think she has the power to stand toe to toe with her. So I am glad that she isn’t a one-off rogue, but an ongoing adversary. We still need to learn more about her … but she sure is interesting. And nice splash page here! 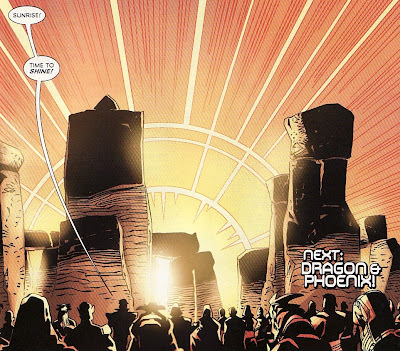 Nrama: It's always seemed a bit of a coincidence that all these Kryptonians landed on Earth just because it had a yellow sun. It sounds like Reign is thinking the same thing? Johnson: Yeah, that ties into a larger story that's unraveling, and it's kind of mirroring Kara's adaptation to Earth. You'll see the unraveling of that mystery. It's very convenient that this happens to be the safe place for Kryptonians after the death of their planet. And feeding into that as well is the question about the House of El itself, because Jor-El and Zor-El both had different plans, different responses to the threat to Krypton, and the difference between the brothers themselves is something we want to explore over the next year. Hmmm, maybe my militant Zor-El prediction is right. I just hope that there isn’t any ‘Kill Kal-El’ style nonsense in the brother’s different viewpoints. Nrama: Last time Superman and Supergirl met, they didn't exactly see eye to eye, as we discussed in our last interview. Johnson: [laughs] That's putting it mildly. But there's a meeting coming up between Superman and Supergirl that deals with how their perception of each other might have evolved now, given their acrimonious meeting the first time. I still think, after realizing that Krypton and her family are gone, that Kara should reach out to Kal for some support. Not reliance! Support. That is what families do. Despite the cover to Superman #6 (with Kal punching Kara), I hope the two come together. Nrama: Then to finish up, can you give us any hints about what 2012 will bring to Supergirl? Green: The next arc really is about, OK, I'm here on Earth, I've taken a stand and said this is a place worth defending. Now what do I do? And we'll see her meeting people and making new friends, or maybe making new enemies. Because if you're going to be somewhere, you have to talk to creatures there and learn their language. Johnson: In Supergirl, over the next year, the series will be all about getting Kara to the point where the trauma, while not over for her, is at least resolved in the story. It's going to be about her adjusting to life on Earth and the new challenges and decisions that brings. It sounds like she'll be the hero I want her to be. This is a great cover. For one, the 'looking up' point of view on comic covers are usually done to make the hero seem bigger than life, to increase the feel of power. Here it shows the exact opposite image, a helpless Supergirl pinned to the wall. But I also love the use of the blue sun as the source of light in the background, slightly washing out Kara's face, the shadows deepening at Supergirl's feet. And the overwhelming blue tint from the sun just pops. Adds to the melancholic feel to the cover. Just given the material, I also think this will stand out a bit on the rack. This was the original cover solicited for Supergirl #6. And while this is a very nice cover of Supergirl fighting with Reign, it is the sort of standard battle scene cover, probably lost amongst the other battle covers on the rack. I think the new cover is overall a better piece of comic art. Hopefully, if a trade gets made of this first arc, this proposed cover will be included in back material. New DC Logo - Supergirl Style? One thing that is potentially interesting is the creation of character or title specific interactive logos as seen above. The glowing green Green Lantern logo and the lightning style Flash one do look pretty. I figured why not try my hand at a Supergirl one. Alas, I am pretty lacking of advanced computer art skills. So take these with a grain of salt. I thought that keeping the Superman style bright blue 'D' added a sort of visual link between the 2 cousins. They are part of the same hero family. That should carry over visually. I thought that adding Kara's unique new S-shield as the underlying 'C', just a hint of her blond hair peeking in to show it is Supergirl, might be nice. It looks a bit dark here unfortunately. I should have tried to lighten up the shield. And here would by my view of the Supergirl big screen. Again, the shield seems too dark for the C in the corner. You can barely make out that it is even a C. So maybe I need to go back to the drawing board a bit. 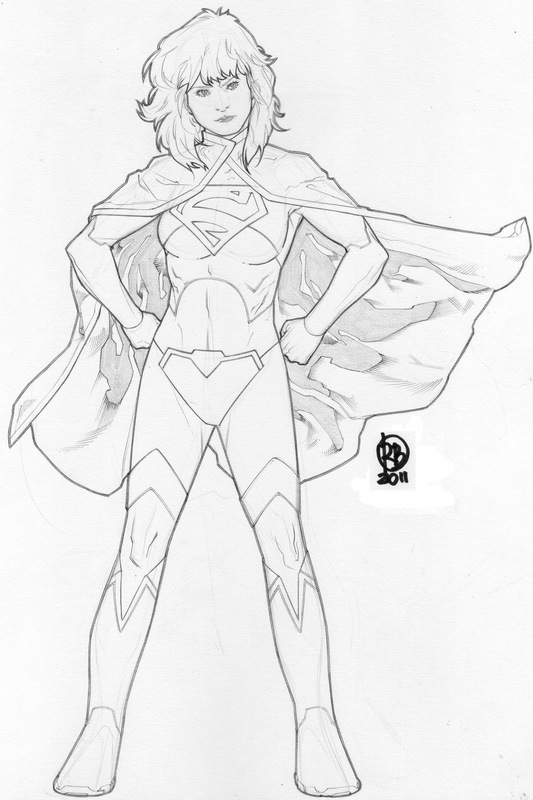 But I think that the Mahmud Asrar cover image from the first issue is stunning and would make the best image to include on a Supergirl logo page. 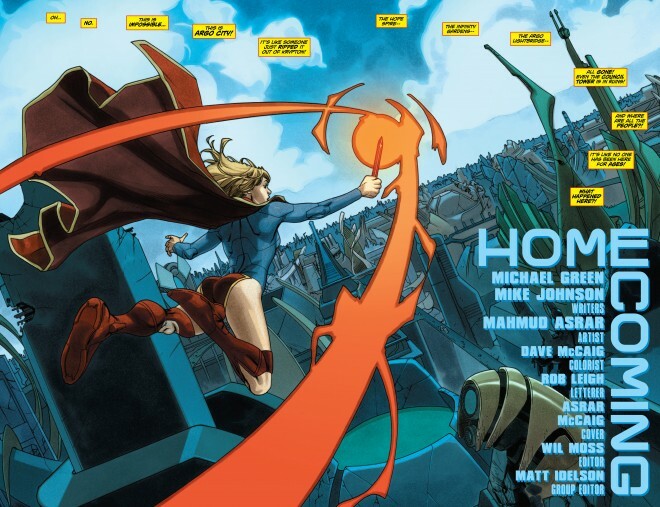 Hopefully DC will give Supergirl her own interactive logo. I'd love to see other 'home grown' attempts too! Legion of Super-Heroes #5 came out last week and I am really struggling to come up with a grade for it; I am really of two minds about it. One of the joys and I am sure challenges of being a creator on Legion is the huge cast in the book. The roster is twenty-something strong. So losing track of a character for a long period of time could be a problem. Writer Paul Levitz has always been able to juggle all these characters, making sure that everyone is checked in on now and then. This issue take a bit of an easy route to solving that problem. 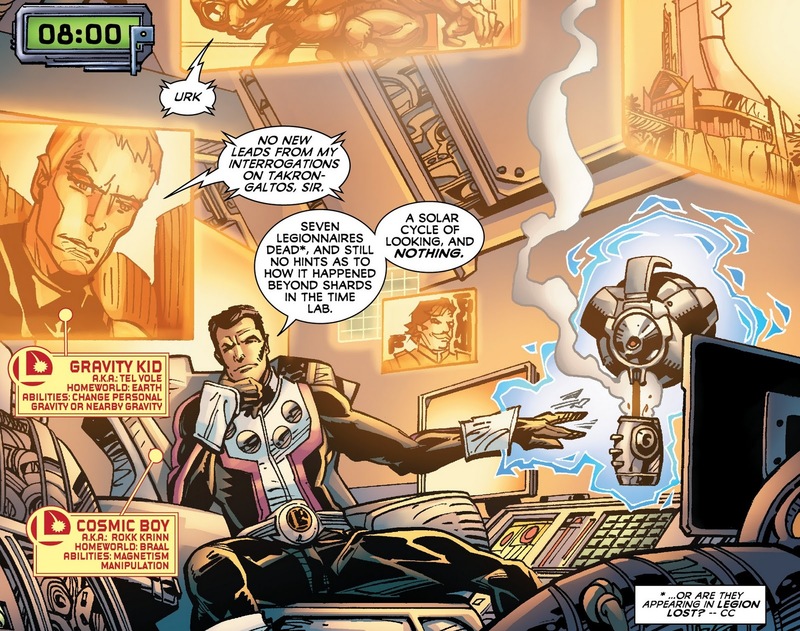 It is literally a day in the life of the Legion, a way for Levitz to check in on what all the Legionnaires are doing as the clock rolls by. And, for that purpose it works extremely well. If you are a Blok fan, or a Saturn Girl fan, or an Invisible Kid fan, you haven't seen much of them in the last couple of Legion arcs. So Levitz gives the majority of the team members a couple of panels and a little characterization to get us up to speed. And for that reason, and as a Legion fan, I thought this was a decent issue, reminding me of where everybody is. On the down side, each vignette is short (they have to be) and somewhat scattershot as we check in for a moment and leave. If you are a Blok fan or a Saturn Girl fan you might want more than just 3 panels. So as a result, the book reads a little disjointed and doesn't seem to add up to much. On top of that, comic legend Walt Simonson drew this book. When I heard Simonson was on board for a Legion issue I was thrilled. 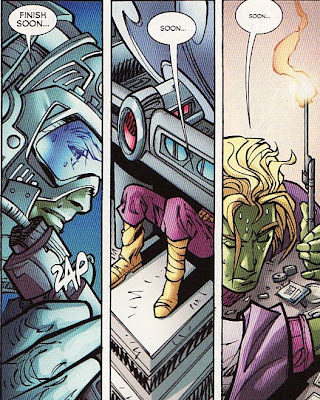 But Simonson doesn't get much chance to shine here, instead drawing normal 'day to day' stuff like Vi running on a treadmill or Brainy working in his lab. Where is the Infinite Man when you need him! And for those reasons, the book felt a little flat. There was something of a running theme of a 'vision of stones' through the book. We open with Dreamy telling Star Boy she saw an image of stones, not a nightmare but a vision. I suppose it is nice to see Thom recovering. In one appreciated segment, we see Rokk distraught over the apparent deaths of the Legion Lost gang. 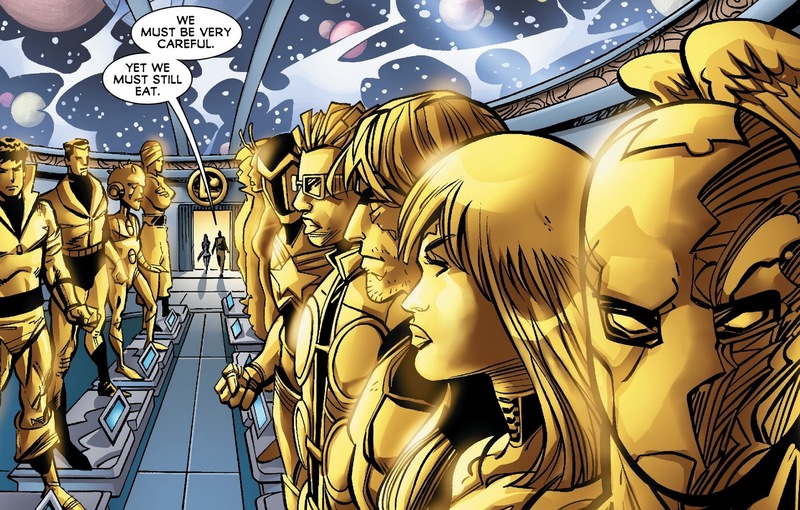 The Legion has always been like a giant family so the loss of seven Legionnaires should have the team upset. At least somebody is. And Rokk is the perfect choice. He has always been the bedrock of the team. Meanwhile, Pandora the cloaked woman ... I mean Glorith ... continues to struggle with adapting to the world of the Legion. She has locked herself into her room and written a letter to the Black Witch that she wants to return to Sorceror's World. Luckily, Invisible Kid comes to pry her out of the room and into the social network of the team. Again, Jacques is a good choice to do this. He was certainly out of his element when he joined the team. So he would probably try to help someone else adjust. Nice view of the hall of heroes here. And after receiving Twilight Sparkle's letter, Queen Celestia ... oops ... after receiving Glorith's letter, Black Queen thinks Glorith needs to stay where she is, that Glorith is the Legion's responsibility now. It reeks of foreshadowing that Glorith is going to turn to the dark side. 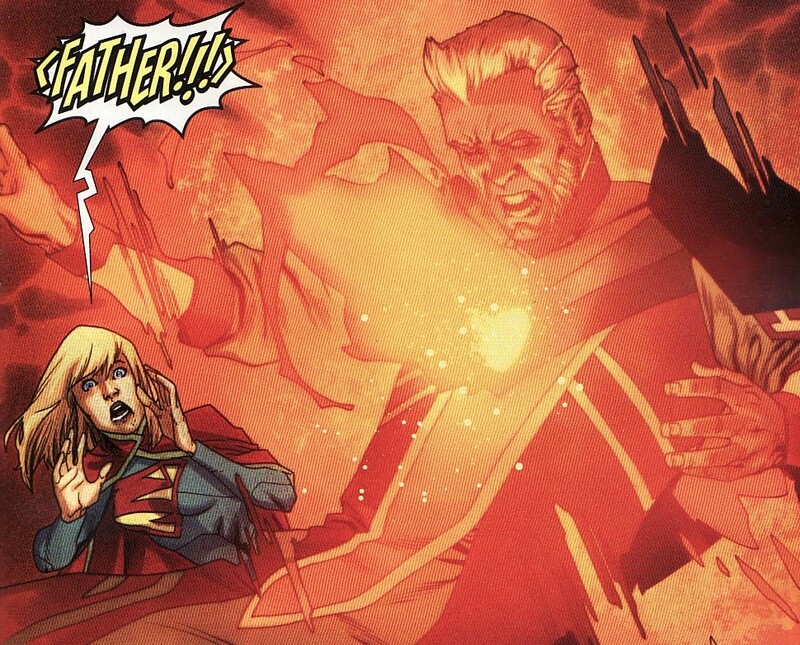 But Mysa is too busy suppressing the absorbed Mordru to have the energy to stop it. It was nice to see these two again, even briefly. Although, to be honest, I miss the White Witch. Just what were those stones that Dreamy saw? Not Stone Boy. Again, a nice little moment. And as a big fan of the original three, I was glad to see that Imra and Garth were having fun settling down as parents to their twins. 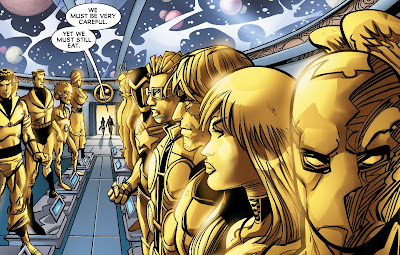 Still, Imra needs to be an active member, especially with Tellus gone. Do the right thing Levitz! Meanwhile, Brainy is working so hard to break the 'Flashpoint' barrier of time travel that he falls asleep working in his lab. And the big stones are Stone Henge? People have gathered there, including Sun Boy. Is this a celebration? Something more ominous? And there were other scenes. Polar Boy returning from a night of bar hopping and amour. Cham talking to the Science Police. Ultra Boy working out some frustrations. Still, I want Walt Simonson showing something like Ayla flinging lightning at The Persuader! Or Sun Boy immolating Doctor Regulus. Not Legionnaires eating lunch and people staring at rocks. So some decent nuggets of characterization. But nothing exciting. I feel like the Legion right now is a comfortable read. But I was hoping for something more invigorating after the relaunch. And I don't think this book would be interesting to anyone other than the most die-hard continuity-filled fan. Over on the site, he posts concept art, penciled pages, and other goodies. So I was thrilled to see his take on the 'new' Supergirl, posted way back in November. How did I miss this!! What a great take on Girl of Steel! She looks stern and tough! But there is that Silva-feel to the whole thing. Stunning! We'll see much more of Silva's Supergirl next month when she shows up in the Superboy book. That image whets the appetite! 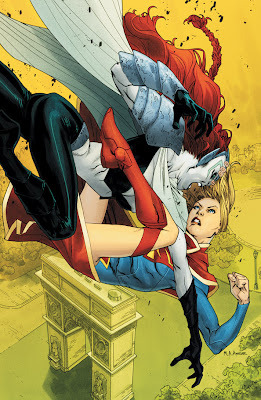 I'm not surprised that Silva renders a great Supergirl. We saw a bit of her in the Jimmy Olsen back-up feature back in Action Comics in late 2010. Ack! I hope Silva ends up being at a convention I am attending at some point! 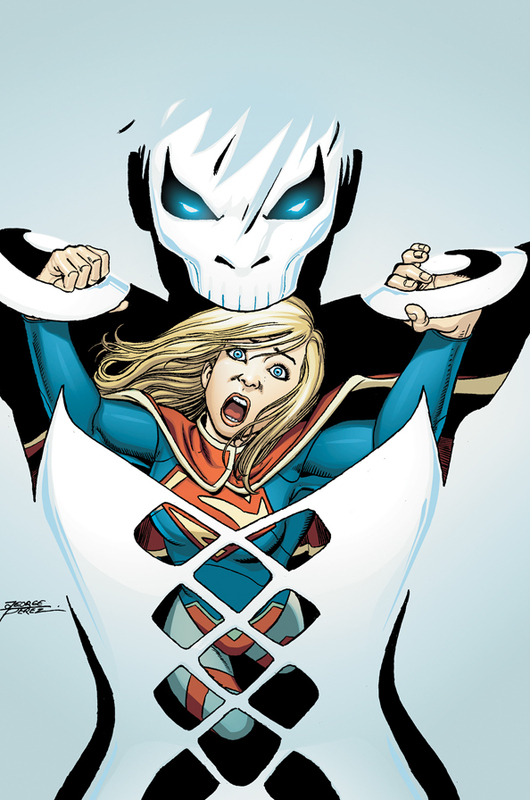 Supergirl #5 came out this week and continued the momentum of the last couple of issues of the title. There has been progression here after a couple of decompressed opening issues. Writers Michael Green and Mike Johnson are working their way through Kara's origins and continue to unveil new elements to the story, answering some questions but creating new ones on the way. One thing that I liked about this issue is that we finally have Kara acting rather than reacting. We are slowly learning about who this Kara is, what she thinks, where she is at emotionally. And we are learning that not only through her actions but through her thoughts. 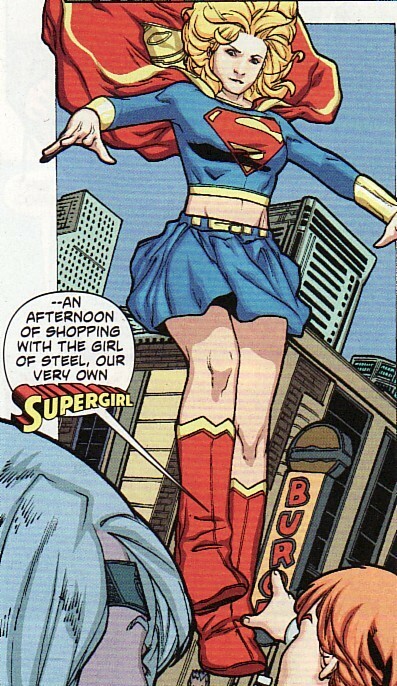 Add to that the introduction of the character Reign, someone who is clearly set up to be a contrast to this Supergirl, a dark reflection of who she could become, and I finally feel like maybe I have a sense of who this Supergirl is. And, as I have said before, I think this is a challenge for Green and Johnson. Supergirl was basically rebooted 7 yrs ago under Loeb and Turner. She was then soft rebooted by Gates and Igle when they washed away the 'Kill Kal-El, crystal hell' aspects of the earliest issues. There will be elements to their story that will echo aspects of the prior origins. Lastly, I wonder how closely the entire super-creative teams meet, how much editorial oversight there is, to make sure that the Krypton in Supergirl mirrors the one being created in Action and referenced in Superman. I hope that there is a universal feel to the planet, streamlined and consistent. As always, Mahmud Asrar's art is incredibly strong here. There is a mix of action and emotional moments in this issue and Asrar shines in all facets of the book. The issue opens with Supergirl streaking through space, flying to the coordinates she saw on Tycho's satellite, the potential site of her home. This is a frantic Supergirl trying to reclaim some sense of sanity in her life, trying to get back home. She hopes her powers won't suddenly leave her. She is desperate and she knows it. And that mix of fear and hope is shown so perfectly on her expression here. Just a great mix of art and words here. Luckily the sun stone seems to be guiding her through space. The stone leads her to a stargate/wormhole takes her to a blue sun system, Argo City in orbit. But the city is abandoned and in disrepair. And obviously separated from Krypton, torn away. The sad truth about Krypton's fate is slowly unfolding. Again, a nice splash page here. So already, a question. Who put up the stargate? And next question. Where is everybody? 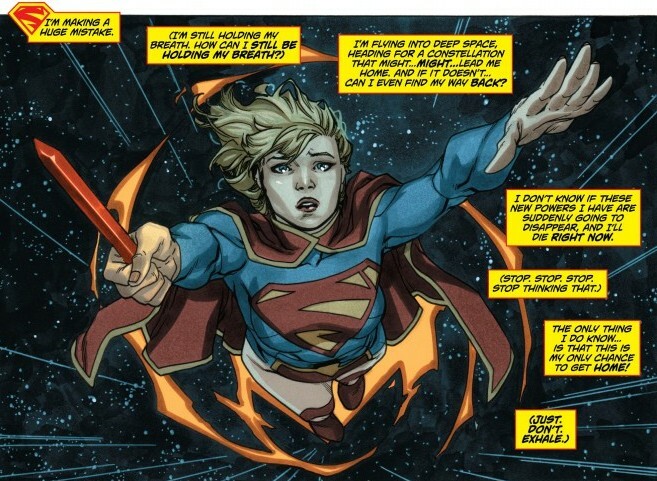 Supergirl flies to her old house, finding it dust-covered and empty. The slow realization that she is alone, without family and friends, begins to take root. 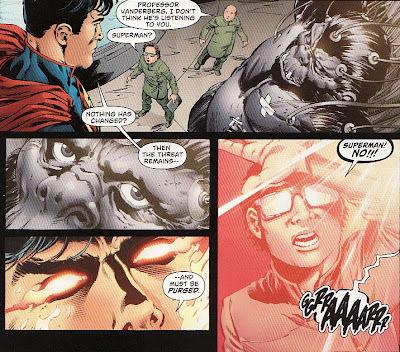 Kara places the sunstone inside a control matrix, activating a message from Zor-El. The destruction of Krypton is imminent and Zor-El has a plan to save the city by erecting a force field around it. But the plan is too risky to include Kara. So Zor-El places her in suspended animation and fires her protective pod away. He states that the time in slumber might affect Kara's memories. So there was a lot to process here. The Silver Age element of Zor-El saving the city with a force field, Argo being ripped from the planet intact is preserved. But this means Kara was fired off Krypton before the planet exploded, not from Argo at all. Interesting. I do have to add that this look of Zor-El seems a bit different from the look of Jor-El in the current Action Comics. There is no headband, no chest symbol, just a tunic. Unfortunately, the message ends in tragedy when someone comes into the room while Zor-El was recording and blasts him through the chest. 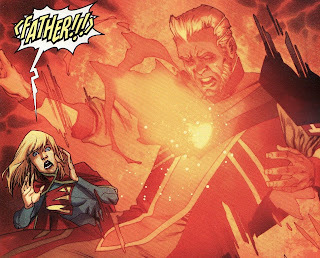 So there are echoes of Zor-El's death in Supergirl #36 at the hands of Reactron. But this also creates a number of new questions. So Zor-El died before the destruction of Krypton. Who killed him? Was Kara already in the pod when he recorded this? If not, who put here there? Who put the crystal into the pod? Who fired the pod? And where is Alura in all this? So there are some answers here but not the whole story. With this message displayed, the sunstone burns itself out, crumbling away. So no further knowledge will be gleaned from it. And then there is this lovely 'silent scream' splash page as Kara reacts not only to seeing her father's assassination but realizing that she is alone. Krypton is gone. Her family is gone. Her friends are gone. This is such a powerful display of the anguish she must be feeling. 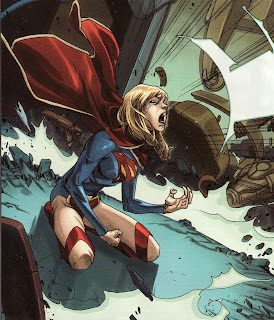 Overwhelmed by emotion, Supergirl flies out into the city and starts smashing anything she can get her hands on. So we have seen Supergirl have an angry response to physical or mental confrontations. Now I hope we will soon see some other emotion from her when she is troubled. Her destruction of the planet is stopped when she is affronted by Reign. Reign says that she is like Kara, looking for answers about who she is and what has happened. 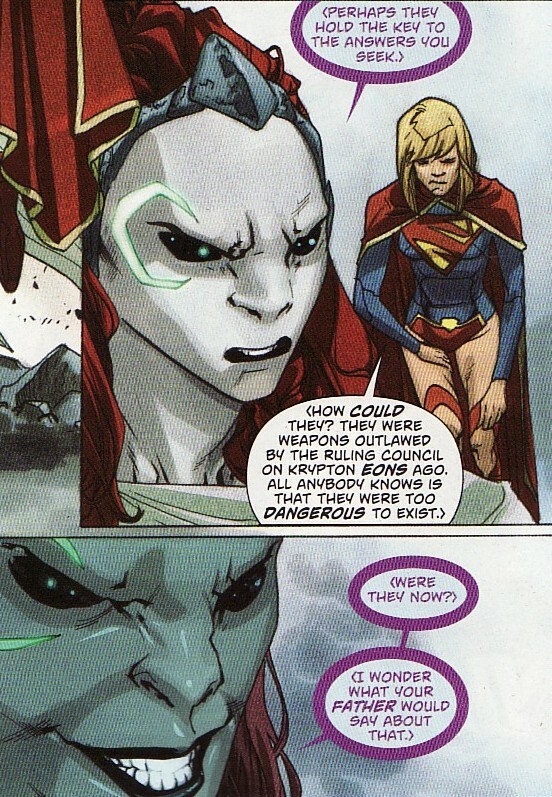 She seems to know a lot about Krypton and the world-killers. 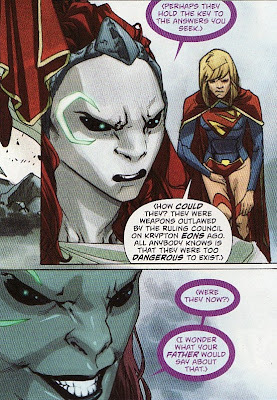 She even hints that Zor-El knew about or was involved with the world killers. 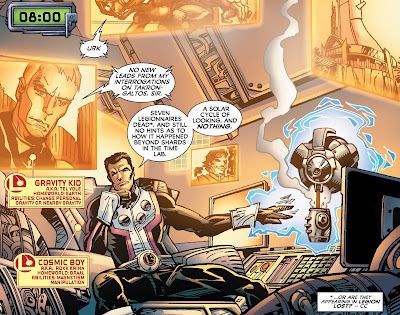 I think we are going to learn more about Zor-El than he is a peaceful scientist. We have heard Kara talk about her 'father's plans'. 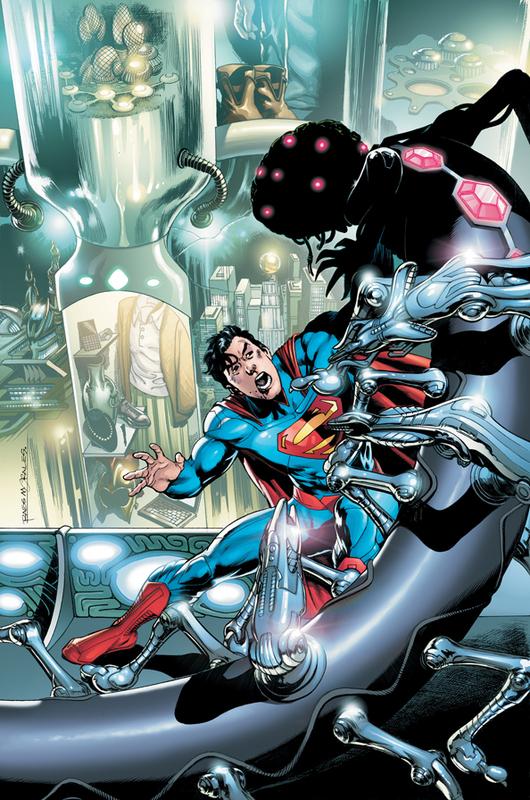 In the first issue, we heard Kara say that an encounter with attacking robots would be something her father would set up. Now we hear Reign talk about Zor-El and world killers. Maybe he was in the military, or a weapons developer. There is more here I am sure. But Kara isn't ready to partake in quiet conversation. 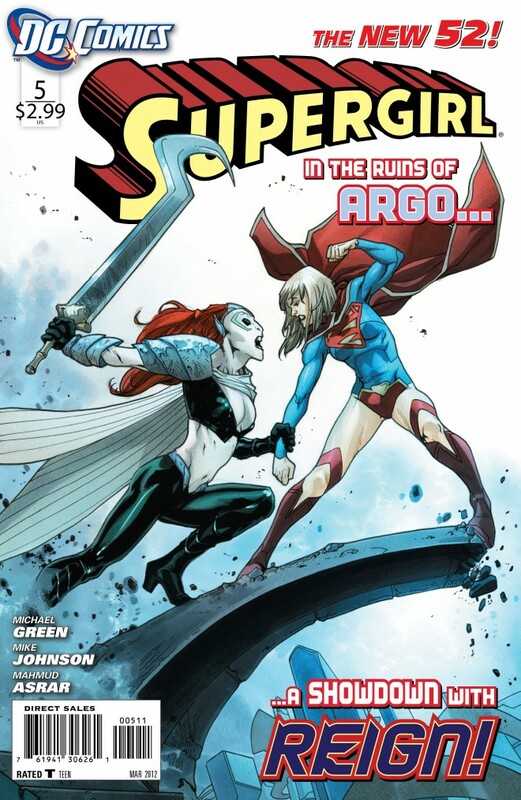 She thinks Reign might be responsible for Argo's destruction and/or the death of Zor-El. Supergirl wants to know what Reign knows. And so she attacks. Again, this immediate response of anger and violence might make sense in the context of the emotional turmoil she is going through right now. But I hope we see other parts of Kara's emotional make-up when things settle down. 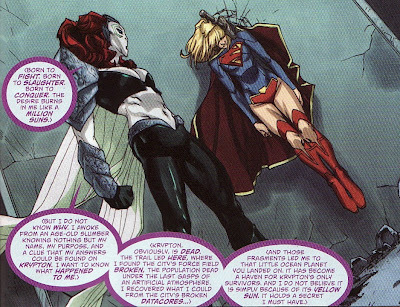 I do like that Reign, a living World Killer, is a nice foil to Supergirl. Reign says a lot of things that this Kara might. She has immense power. She was born to rage. She could conquer. Those are all things that Supergirl could say, might say. But what I have seen is that this Kara won't take that last step, stopping her fight with Superman when innocents were threatened, hoping that her destruction of Tycho's satellite didn't kill anyone. Reign is a monstrous version of what Kara could become, a dark reflection, and a nice way to show us who this Supergirl is by showing us what she isn't. Again, we see more of those similarities between Reign and Supergirl. Reign is looking for answers about her origins. She wants to know what happened to her. She went to Earth looking for those answers and then came to Argo for the same. Hmmm ... basically Supergirl's story so far. Again, it makes Reign a nice foil. When Kara eventually steps up and defeats the World Killers, it will show who Supergirl is. This also added more questions to the fate of Argo. Reign showed up and found the population dead. So where are the bodies? And I really hope that we get to see something of Alura. So, overall this was a good issue. 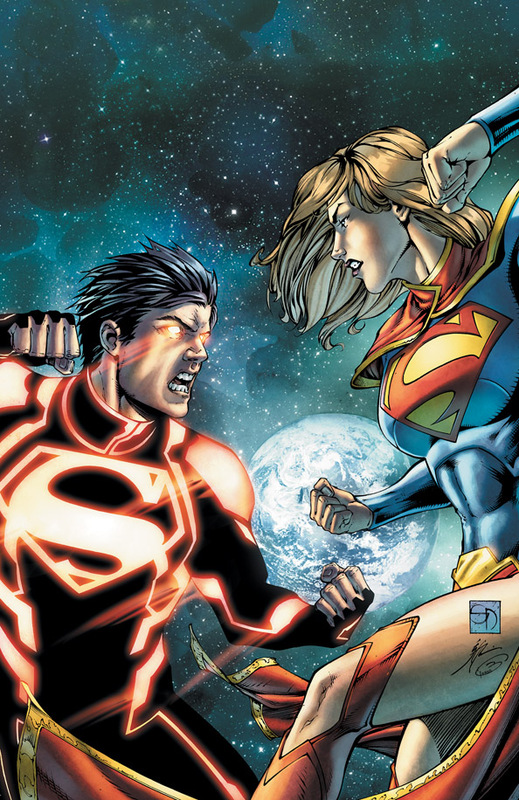 We learn more about Supergirl's origins, more about Zor-El, more about Argo. and more about the World Killers. We also have a lot more questions that need to be answered. Reign plays a contrasting role to Supergirl nicely. We have more raging Supergirl. 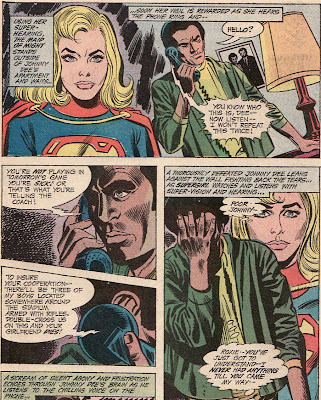 I hope next issue, we see a quieter Supergirl dealing with her grief in a nonviolent way. And I have to say it again. If you are Superman and another surviving Kryptonian comes to Earth, someone who is potentially family, I doubt you would leave her to her own devices. I better see Kara seek out Kal or vice versa soon. It doesn't make sense otherwise. Lastly, I could spend a whole post gushing about Mahmud Asrar. Amazing stuff here. The DC Comics solicits for April 2012 have been released over on the DC Comics website here. It is an interesting month as six titles have the 'final issue' tag on them in what feels like a quick axe for the reboot. As I have said before, I wonder if DC was a bit quick to act here. Here are the super-titles solicited as well as a couple of surprises. Don’t miss this special issue featuring artwork by comics legend George Pérez! As I have said before, George Perez is a pretty awesome pinch hitter for Mahmud Asrar on this issue. 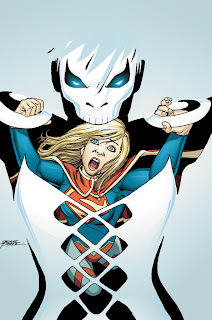 That cover alone is worth the price as Supergirl seems trapped within the body of Silver Banshee. Nice use of the straps of the costume to mimic prison bars. And while I am glad that Siobhan comes on board as a supporting cast member/frenemy, I do worry about the NYPD hunting down Supergirl. I'm ready for Supergirl to be an accepted hero. I understand that the 'alienated young girl' theme is an important part of this reboot. But I hope it isn't overplayed. And I really hope we see Superman back here before this. I still can't believe he would let another Kryptonian, let alone his family, wander the Earth. He would want to be part of her life, regardless of what Kara wants. It’s the epic 30-page conclusion of Grant Morrison and Rags Morales’ majestic opening storyline! 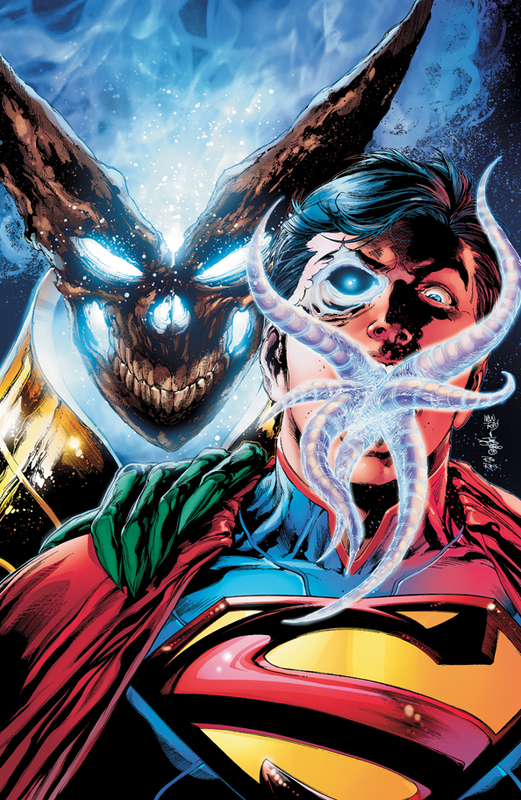 $3.99 gets you front row seats to the ascension of the DC Universe’s first Super Hero as The Man of Steel goes toe to tentacle with the all-new Brainiac for the final fate of Metropolis! I have been trumpeting Action Comics as the jewel of the new DCU and DC seems to understand it as well. What could be better than a 30 page mega-finale to the opening arc. And this is an arc that presented us with a young crusading Superman, re-introduced Luthor and Brainiac, brought us the bottle city of Kandor, and showed us Jor-El, Lara, and Krypto all over again. It has been a dizzying ride ... but wonderful. I also think I am going to want to grab the Gary Frank variant. Frank just reinvented Brainiac and retold Superman's Secret Origin himself. So I am glad he is being tangentially included in this reboot. Superman, agent of the Daemonites?! How has Helspont bent The Man of Steel to his will? I don't know Daemonites or the Helspont at all. 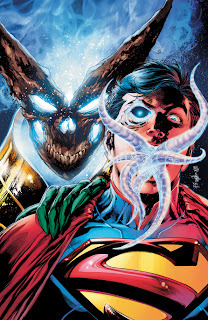 There is a Starro flavor to this cover. But not much info. I am hopeful that Keith Giffen and Dan Jurgens can bring some punch to this title. Jurgens guided the Superman ship throughout much of the 90s. That Superman was the definition of heroic. So maybe the 'Metropolis doesn't trust or like Superman' part of the Perez arc will go away. 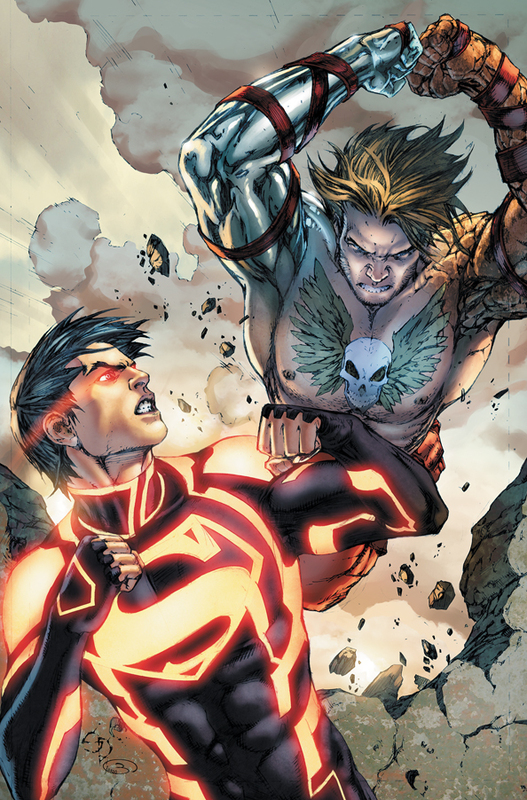 Well, that rescue mission didn’t go exactly as planned…and things have only gotten worse for Superboy, as N.O.W.H.E.R.E.’s plans for him and the Teen Titans take a deadly turn! If he wants to keep his head, he’s gonna have to take down another dangerous young metahuman for them: the bruiser once known as Grunge! I have also been pretty upbeat about the Superboy title. But it is pretty clear that this book is being used to introduce the Gen13 characters to the DCU. I have loved Fairchild's part in the book because it felt natural. She was a supporting cast member. But this issue having Superboy fight Grunge (a character I know virtually nothing about) seems like a simple way to bring in another Wildstorm character. 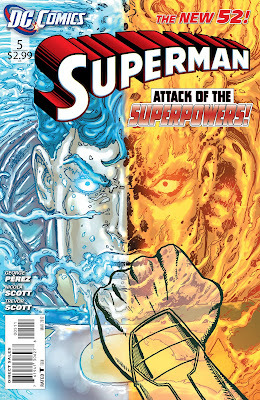 This also continues the run of 'Superboy fighting heroes' cover images. I also think that DC really wants me to read Teen Titans, linking it closely to this book. And frankly, I don't want to read that version of the team, that Tim Drake, that Wonder Girl, that Kid Flash. I hope this book remains separate enough that it can be enjoyed alone. 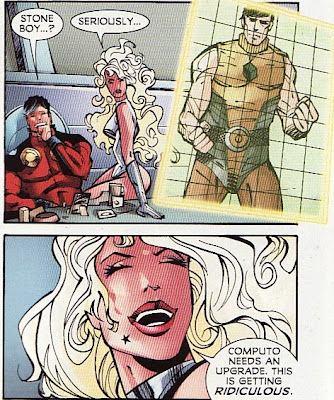 One of my favorite characters of the reboot is also from the Superboy book, Rose Wilson. She even seems to be getting her own title soon ... The Ravagers. 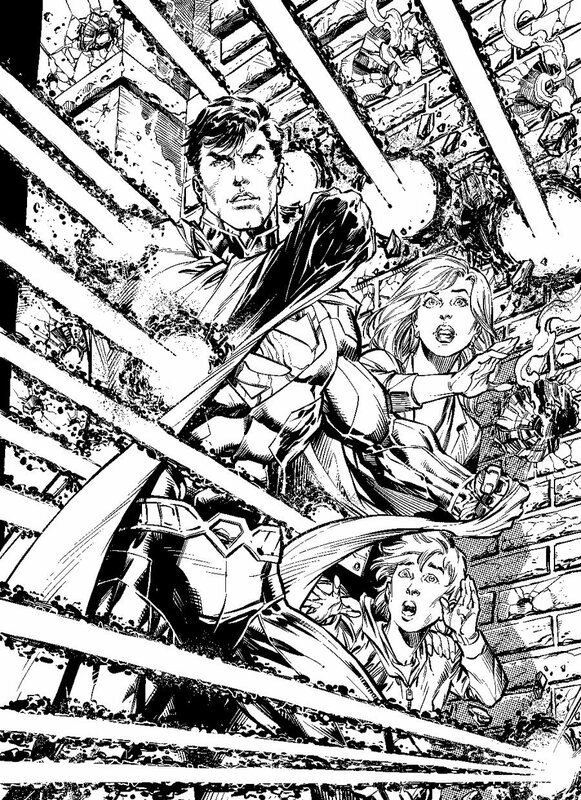 Now DC is doing a crossover event between Superboy, Legion Lost, and Teen Titans. Man, DC must really want me to read Teen Titans (or maybe they want all the Titans readers to read Legion Lost). I don't know if even Rose can be a threat to the Legion squad in Legion Lost. That said, if this cover is any indication, I am going to love Pete Woods rendition of Rose. I hope new writer Tom DeFalco is able to continue the feel that Fabian Nicieza had on the book. In the debut of SUPERMAN BEYOND, The Man of Tomorrow returns home to an unfamiliar City of Tomorrow patrolled by super-powered police officers. With most of his loved ones gone, he wonders if Superman has a place in this new world. But time and death hold no meaning for a foe who has set a plan in motion to destroy the Man of Steel once and for all! In BATMAN BEYOND, Russian criminals have taken Mad Stan’s dog and Stan will stop at nothing to get them, even if it means blowing up all of Gotham City in the process. As if Terry doesn’t have enough to handle, his girlfriend comes to him with shocking news about her brother. In JUSTICE LEAGUE BEYOND, the team works to break the brainwashing Micron underwent, while getting a valuable history lesson from Amanda Waller...but will it help them discover Kobra’s plot in time to save the world? So I reviewed the Superman Beyond one-shot when it came out so I might get this issue of this mini-series to see what this is all about. This looks like a 'Batman Beyond Family' book with multiple stories per issue. But I don't know if I will be in for the long haul. So looks to be an interesting month with Supergirl and Action leading the way.